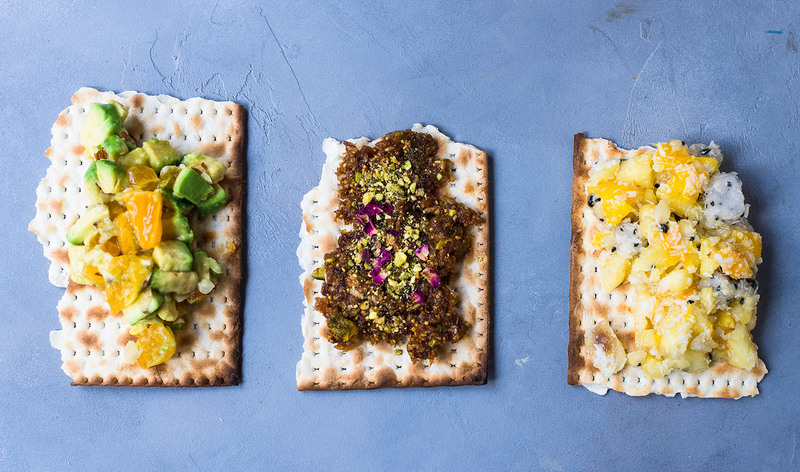 Every year I think of something new to bring to the Passover table, literally. Now don’t get me wrong, there is nothing more perfect than my moms’ classic charoset (a traditional item in the Passover seder), full of apples, red wine and pomegranate seeds. But this year I thought it would be so fun to bring not one…not two…but THREE charoset options for an around-the-world theme! I come from a fun diverse background, having lived in Hawaii, New York and Southern California, so expressing culture through food is exciting to me. And this Passover, I created twists on the traditional charoset based off the cultures I admire most. This tropical charoset blends some of my favorite Hawaiian flavors. 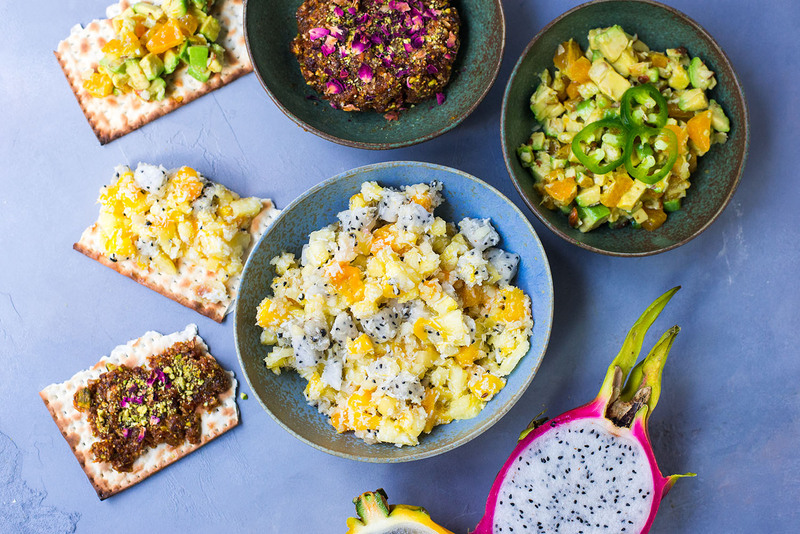 Mild dragon fruit tossed with shredded coconut, sweet mango and crushed macadamia nuts make for a dreamy combination and is sweet enough for a light dessert. If dragon fruit is not easily available, substitute with cubed fresh papaya to keep that sweet mild flavor. The second charoset is a Persian style that is sweet and tangy. Loaded with dried fruits with apricots, dates and figs, the nuts and tart pomegranate molasses bring it all together. Smear Persian charoset on matzah or roll it into balls for charoset truffles. Tex-Mex charoset-salsa is a play on just that..salsa! Living in Southern California, tajin is a favorite spice (if you can’t find it, substitute lime zest and chile powder). It’s sprinkled on all sorts of fruits (my favorite being mango! ), giving the fruit the perfect pucker along with avocado and toasted almonds and just enough jalapeno for a little spice. Which charoset will you make this year? Add all ingredients to a bowl and stir to combine. Store in the refrigerator for up to three days. Add all ingredients to a food processor and blend until evenly incorporated. If you don’t have a food processor, you can chop all the ingredients finely and stir to combine. Samantha Ferraro is the food blogger and photographer for The Little Ferraro Kitchen. Samantha comes from a diverse Jewish and multi cultural background with both Sephardic and Ashkenazi roots and has lived all over, including Brooklyn, Hawaii, Southern California and now in the Pacific Northwest. Samantha blogs about world cuisine recipes and lives in beautiful Washington with her Italian husband and adorable fluffy dog Hula and is writing her first cooking, coming out in Spring 2018. You can visit her blog over at Little Ferraro Kitchen.